Carl Icahn’s investments in energy just haven’t paid off. Billionaires are known for making bold bets in hopes of building even more wealth. Those bets, however, don't always pay off. Just ask Carl Icahn who has lost billions on his energy trades this year. That's after bold bets on Chesapeake Energy (NYSE:CHK), Freeport-McMoRan (NYSE:FCX), Cheniere Energy (NYSEMKT:LNG) and Transocean (NYSE:RIG) all plummeted due to further deterioration of both commodity prices as well as credit availability. In many ways Carl Icahn built the perfect energy growth portfolio. He has shale gas king Chesapeake Energy, which has not only grown into the second largest natural gas producer in the U.S., but is under a new management team that has been promising to shift the company's focus from growth at all costs, to a returns-driven growth focus. Then, he has Freeport-McMoran, which is not only the world's second largest copper producer, but it has a wealth of low-cost oil projects in the Gulf of Mexico to go with ample natural gas opportunities along the Gulf Coast that are strategically positioned to benefit from natural gas exports. Speaking of natural gas exports, Icahn owns Cheniere Energy, which is building the largest portfolio of LNG export facilities on the Gulf Coast. To top it off, he owns Transocean, which has the largest fleet of offshore drillships. In a lot of ways, Icahn was making a strategic bet on two megatrends that had been emerging in the energy sector over the past few years: Offshore drilling and LNG exports. Because demand for both oil and natural gas is growing worldwide, new sources of both commodities need to be developed to not only meet this demand, but also to offset production declines and depletion from legacy fields. Shale gas and deepwater oil plays are important parts of both equations. What's worth noting about this slide is that 30% of the projected impact to supply is coming from deepwater sources, which aren't projected to be replaced because of current industry economics. In a sense, that chart is showing just how much those supplies will be needed in the future, even if the industry isn't investing in them at the moment. Said another way, rumors of the death of the offshore drilling industry have been greatly exaggerated, boding well for the future of both Transocean and Freeport-McMoRan's oil business in the Gulf of Mexico. U.S. shale gas as well as American LNG export facilities are expected to be a big supplier of this demand. According to analysts at Wood Mackenzie, demand for U.S. natural gas for LNG is expected to rise from basically nil last year to 10.8 Bcf/d by 2025. That's roughly 10% of projected supplies in 2025 and represents nearly 40% of overall natural gas demand growth in the U.S. over the next decade. 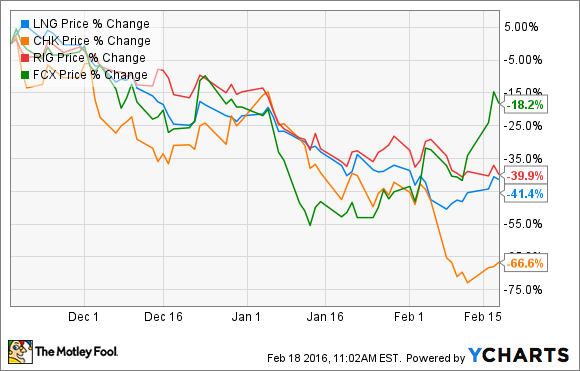 It's a trend that bodes well for Chesapeake Energy, Cheniere Energy, and Freeport-McMoRan. It's debt that was manageable when oil and gas prices were higher, but is a big weight now that prices have plunged taking energy-related activities and available credit down with it. Carl Icahn big energy bet has blown up in his face because the companies he invested in borrowed heavily to build their companies around two megatrends. 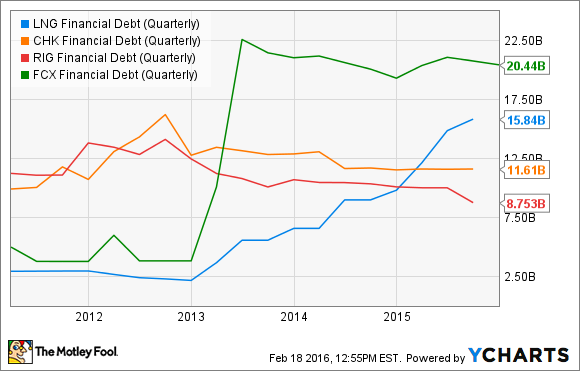 That debt is now a big weight because those trends are on hold while the industry sorts out its near-term overcapacity issues. Icahn's story is a reminder that debt works both ways. It leverages gains in good times and losses in bad times. The takeaway is clear, even the best investment thesis can blow up when it's being fueled by debt.